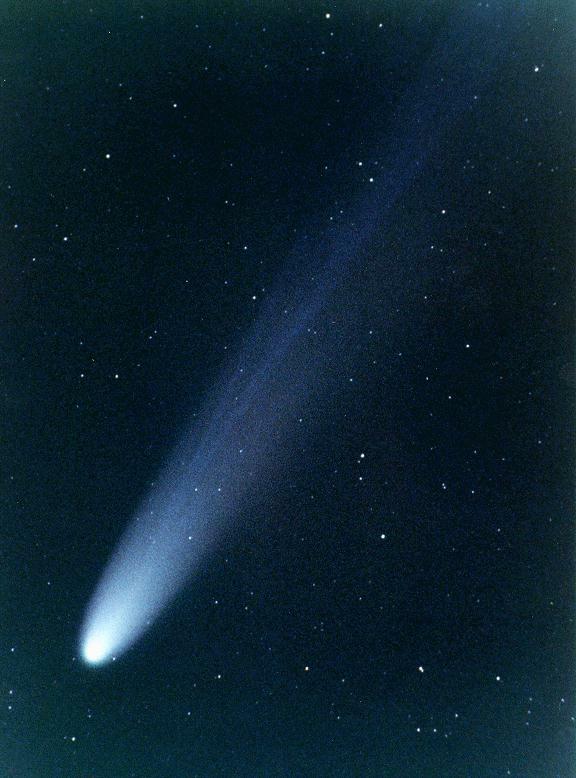 This ninth magnitude comet was in a similar area of sky to Hale-Bopp during the summer of 1996. This image was obtained by Martin Mobberley at 0146 on 1996 May 21. He used a 160s exposure with an SX camera on his 0.49m, f/4.5 Newtonian. South is at the top in this 9.7x6.0 arcmin view. 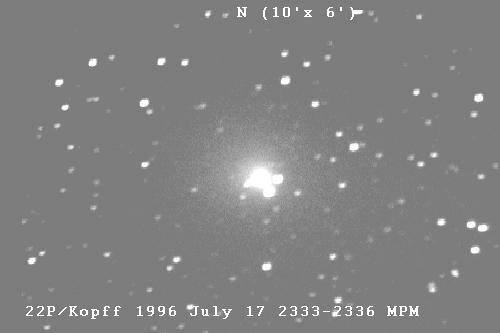 By 1996 July 17 the comet was around -20 degrees declination and Martin obtained another image using the 0.49m. 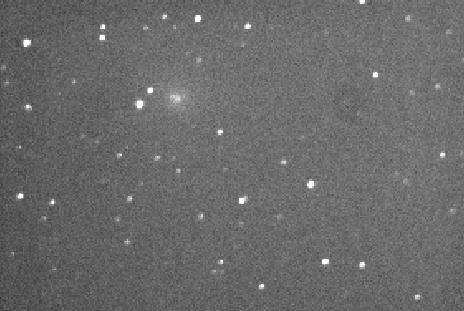 This comet, the second to be discovered in a month by Hyakutake, exceeded expectations and was an incredible object. It was at its best at close appoach in late March but it also put on a spectacular show as it moved in towards the sun in April. It was recovered by southern hemisphere observers in mid-may as it moved away from the sun. When it was discovered the comet was far south of the equator. 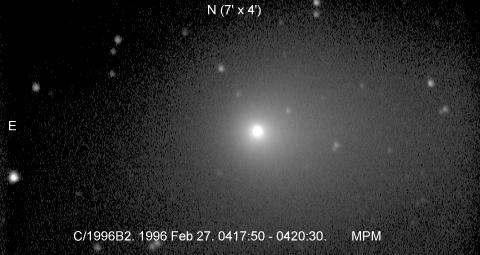 David Strange obtained this image on 1996 February 15. It is a 4x40 sec exposure using a Starlite Xpress + 50cm f/4 Newtonian at 0520h U.T. A bright central condensation is visible. A false colour image reveals a coma offset slightly towards the west It was taken in fairly hazy skies, and at Dec -24deg the seeing conditions were far from perfect. The image has south to the top and is 7x5 arcmin in size. 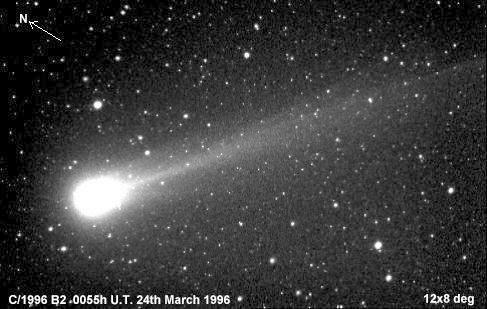 The comet had brightened considerably by the time that Martin Mobberley took this image on 1996 February 27. He used a 0.49-m Newtonian and an SX camera. 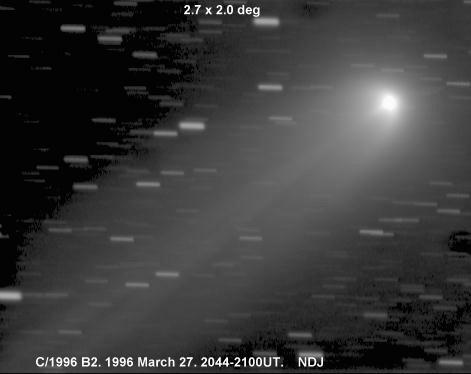 By 1996 March 17 the comet had grown a substantial tail as shown in this image from David Strange. The image was taken 0101UT with a 4x80s exposure using an SX camera and a 135mm, f/2.8 lens. David comments: "Through the 50cm f/4, ten second exposures show a short pointed tail two arc minutes long coming from the central condensation in PA 275 deg. 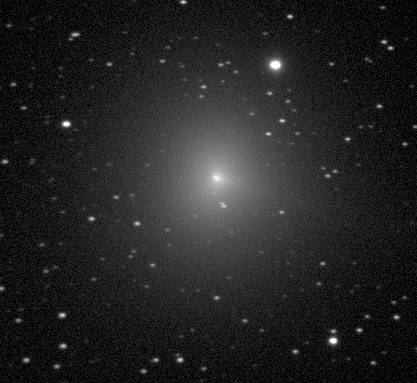 Visually in the 50cm the coma fills a 30 arcmin field of view, and the comet is now an easy naked eye object. 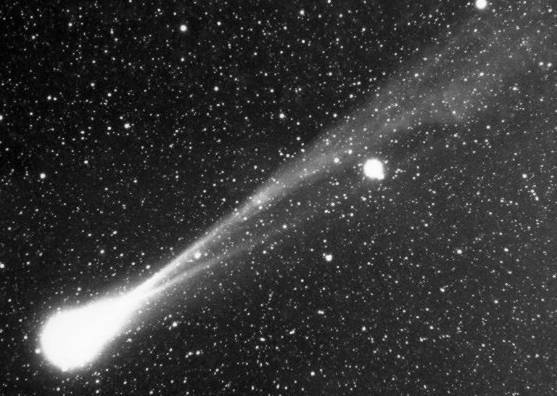 Between March 22 and March 26 TA observers Nick James, Martin Mobberley and Glyn Marsh travelled to Tenerife to observe the Great Comet of 1996. The weather in the Canaries was certainly an improvement on that in the UK and the detail visible in the tail was incredible. The comet was observed over four nights around closest approach and some of the best images obtained are included here. 1996 March 23, 0250, 4 min, 85mm, f/1.8, TP2415. Arcturus shines through the double tail of Hyakutake as seen on the morning of March 23rd. 1996 March 24, 2300, 3 min, 50mm, f/2, 3M1000. This image was obtained as the thin crescent Moon was setting in the west. The tree in the foreground was illuminated by a flash midway through the exposure. The observing site was at 5,000 ft on Mount Teide and the comet's tail was over 50 degrees long from this location! 1996 March 25, 0019, 4 min, 85mm, f/1.8, TP2415. 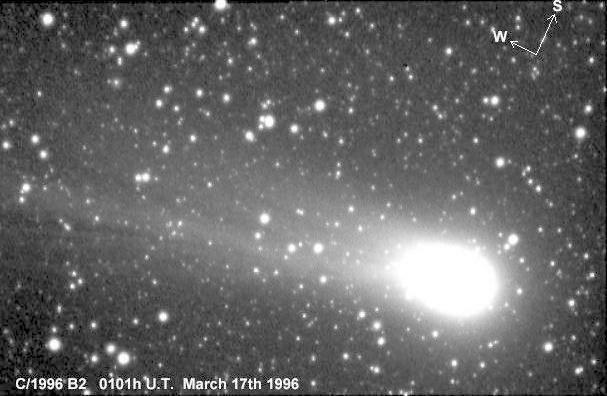 An image of the comet obtained on 1996 March 25 at 0019 shows a great deal of detail in the tail including a number of disconnection events. This disconnections moved rapidly away from the head over the next few hours. 1996 March 25, 0322-0334, 12 min, 50mm, f/2, TP2415. This long exposure was guided on the comet's central condensation. The stars appear as trails since the comet has moved a considerable distance during the exposure. The exposure lasted from 0322 to 0334. 1996 March 26, 0320, 3 min, 85mm, f/2, Fuji Super G800. 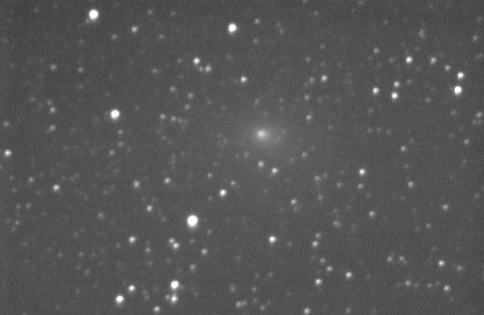 On 1996 March 24 David Strange obtained this image of the comet using a 28mm lens and SX CCD. Wilst the tail is impressive the inner coma also shows a great deal of detail. A few days after returning from Tenerife Nick James obtained an image on 1996 March 27. He used a 135mm telephoto lens and an SX camera. camera. It is a composite of thirty 20s exposures taken between 20:44 and 21:00 on 1996 March 27. The image has been processed to show the hoods and short tail-pointing spike in the inner coma. The rotation of the comet's nucleus is well shown in this 34k MPEG movie of the central coma region. Terry Platt Obtained nine frames of the comet at roughly half hour intervals between 1940 and 2341 on 1996 April 1. A jet is seen eminating from the spinning nucleus rather like water from a garden sprinkler. 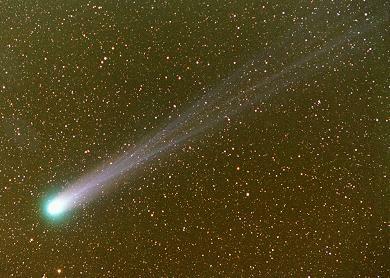 A spectacular photograph the comet was obtained by Gerald Rhemann from Ebenwaldhöhe, Austria. He used a 190/255/435mm Schmidt and Kodak Gold Pro 400 film in 120 format. This is a 4 minute exposure taken at 1946UT on 1996 April 17. 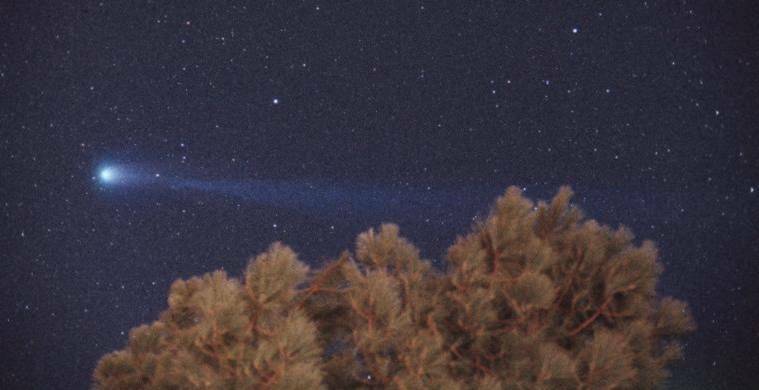 It clearly shows both the gas and the dust tails of the comet. A prominent tail is visible in this image taken at the prime focus of a 5.1", f/6 Astrophysics refractor by Andy Sefton. The photo is a 5 minute exposure on hypered Ektachrome 320T at 2150UT on 1996 April 18. 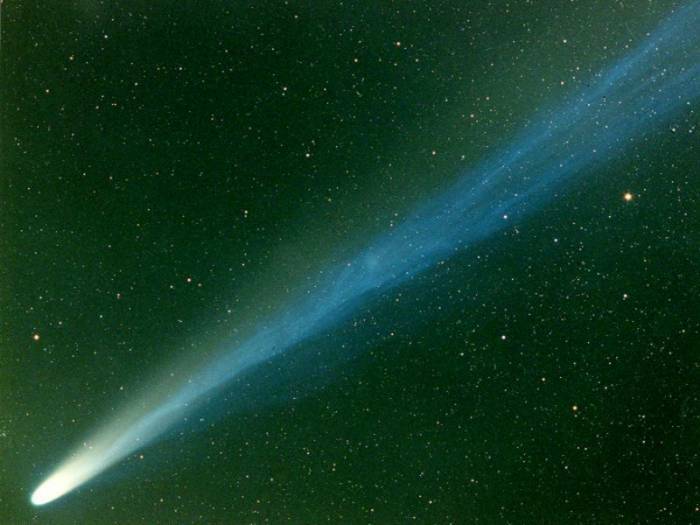 This comet was discovered on 1996 January 27 by Edward Szczepanski of Houston. The comet has a perihelion about 0.45 a.u. outside the earth's orbit. 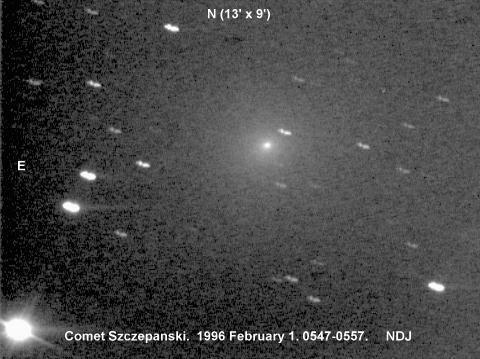 On 1996 January 31 Denis Buczynski obtained this relatively wide field frame showing the comet. He used a 500mm, f/3.5 Celestron Comet Catcher, a 180s exposure and an SX camera. 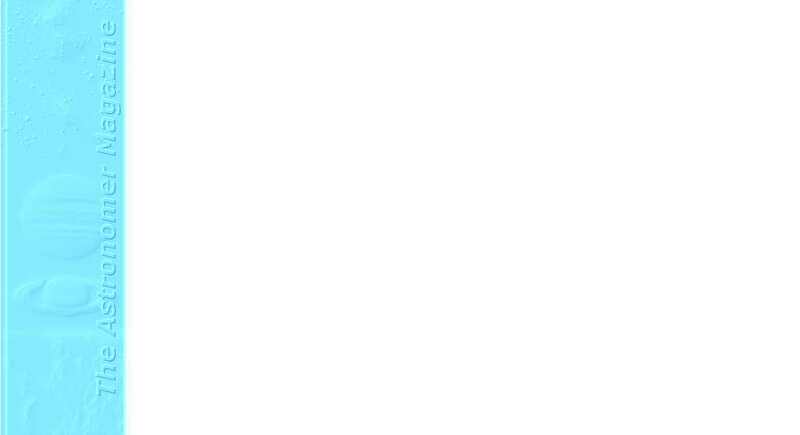 The field of view is roughly 45 x 30 arcmin. 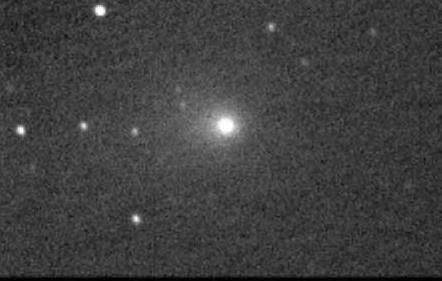 On the next morning Nick James took this picture of the comet using a 0.30m Newtonian, a ten minute exposure and an SX camera. The field of view in this case is about 13 x 9 arcmin with north at the top. At the time the comet was in Ursa Major. 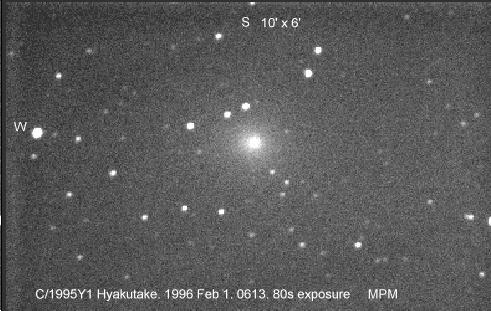 "H. Sato, National Astronomical Observatory, Tokyo; and S. Nakano, Sumoto, Japan, report the visual discovery by Yuji Hyakutake of a comet. The discoverer, based at Hayato, Aira-gun, Kagoshima-ken used 25x150B for the discovery and described the comet as diffuse and of diameter 3.5 arc-minutes." 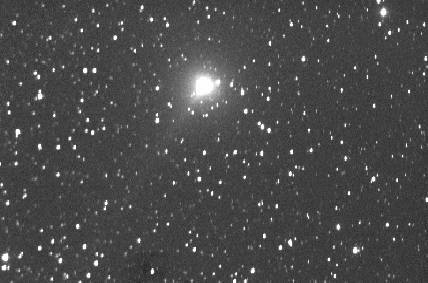 On 1996 February 1 Martin Mobberley took this picture of the comet using an 80s exposure with an SX camera and his 0.49m Newtonian. South is at the top in this 10 x 6 arcmin frame. Comet Tabur was discovered by Vello Tabur on 1996 August 19. At that time the comet was a tenth magnitude fuzz in Eridanus. The orbit is highly inclined as shown in this orbit diagram. 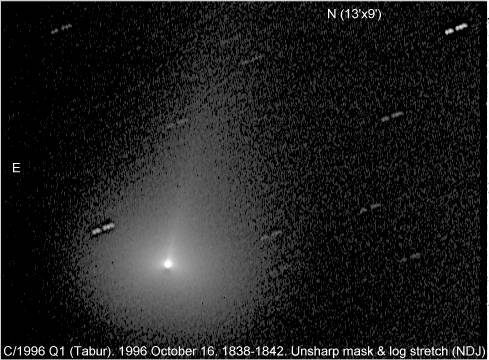 The comet was quite condensed as can be seen in this image taken on 1996 September 16 by Giuseppe Sala from St. Barthelemy in Northern Italy. This is a 120s exposure at 0348 using a 25cm LX200 at f6.3 and an SXL8 camera. The field of view is 14" x 13" but the orientation is unknown. 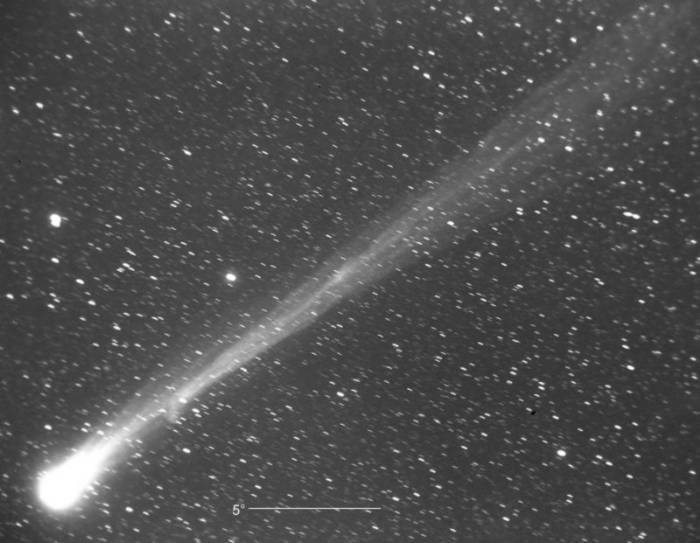 A nice short tail is visible in this image of 1996 September 21 taken by Denis Buczynski. He used the Celestron Comet Catcher and an SX camera at 0355. By 1996 October 16 the comet had a prominent tailward pointing jet. This image was taken by Nick James using a 0.30m Newtonian and an SX camera. The image was processed using an unsharp mask and a log stretch.